Featuring a full suite of premium fitness features, a stylish yet practical design, and an enhanced and intuitive user interface, Samsung’s recently released Gear Sport smartwatch was designed to help people get more out of their day, and live a healthy and well-balanced life. Here, two of the minds behind the Gear Sport’s design, Product Planner Sungjin Kim and UX Designer Hayeong Jeong, discuss Samsung’s efforts to design a sports watch that’s in a league of its own. Q. Who was the Gear Sport designed for? Kim: Our chief priority when designing the Gear Sport was to introduce a smartwatch that featured new, easy-to-use functions that allowed users to go ‘beyond fitness’. Conventional sports watches tend to be huge and heavy, and designed mainly for those who are interested in pushing their bodies to the limit to reach peak condition. We’ve tailored the Gear Sport to those who want to work out and stay in shape, but aren’t necessarily interested in becoming a pro athlete. The result is a smartwatch that’s sleek, comfortable and great for everyday wear, and packed with features that empower users to get the most out of a workout whenever they wish. We set out to design a device that struck a fine balance between stylish design and powerful, fitness-focused function, and we’ve been delighted to hear that the result of our efforts has gotten great feedback from users. Q. What are some of the ways that the Gear Sport streamlines exercise? Kim: The Gear Sport features built-in GPS and an advanced, continuous heart-rate sensor, and is one of the first Samsung wearables (along with the Gear Fit2 Pro) to boast 5 ATM (50-meter) water resistance. This level of water resistance means that the smartwatch is built to not only stand up to rain and the odd splash, but also dips in the pool. 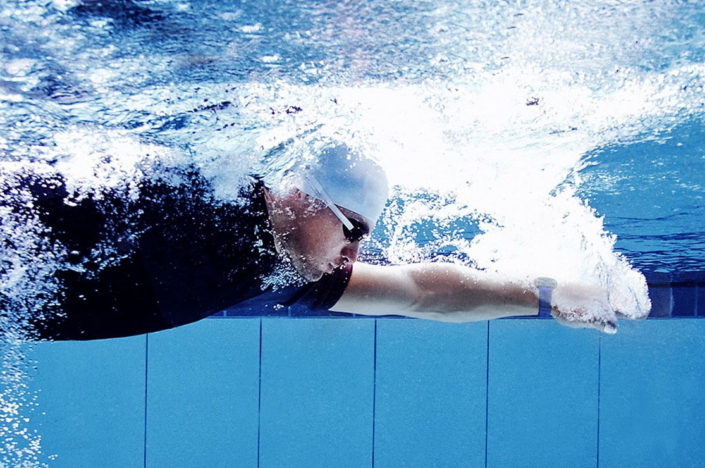 In fact, the Gear Sport’s support for swim-tracking app Speedo On makes it the ideal companion for any swim. The device is packed with powerful fitness-tracking software, including a built-in “pace-setter” feature that makes it excellent for managing runs, as well as automatic activity detection. And by seamlessly syncing with Samsung Health, and allowing users to easily log their calorie intake directly into their smartwatch, the Gear Sport also offers tools to help users keep better track of their eating habits and ultimately achieve their weight goals. The smartwatch is also great for home training. Its Samsung Health integration allows you to easily access an expanded collection of fun fitness classes from third-party content providers that may be streamed to your Samsung TV using your Samsung smartphone’s Smart View function, while its continuous heart-rate tracking allows you to monitor your performance on your screen in real-time during your workout. Q. The Gear Sport also introduces a new, square form to the Samsung smartwatch lineup. What inspired this adjustment? Kim: We chose to equip the Gear Sport with a case that combines the Gear line’s signature bezel with a slightly square body not only because it created a unique way to differentiate the device from our other offerings, but also because it allowed us to incorporate a large, 300 mAh battery. The contours of the case make the Gear Sport quite comfortable to wear, and add a nice, elegant touch to the device’s overall aesthetic. Q. How have you enhanced the Gear Sport’s familiar, circular UX? Jeong: Our wearables’ signature UX makes accessing their functions simple and intuitive. When we set about designing the Gear Sport, we prioritized finding useful ways to enhance the circular UX, and make best use of the versatile bezel. 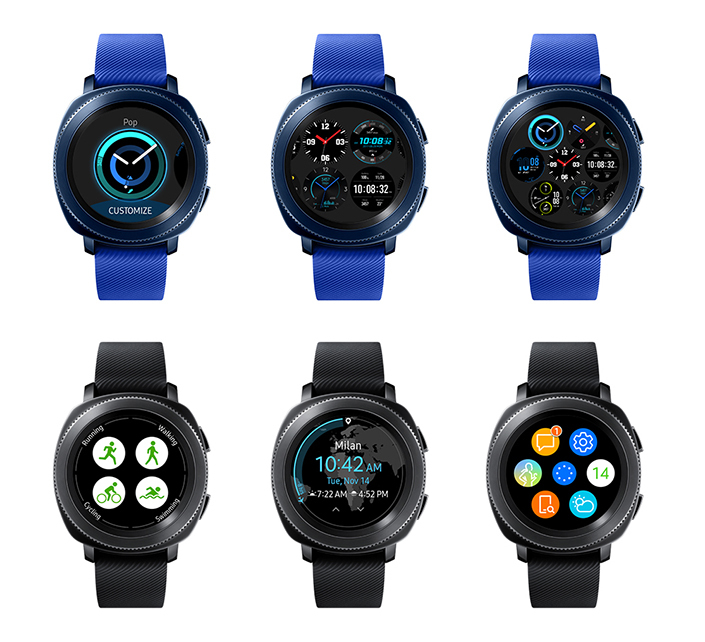 The Gear Sport’s UX enhancements make it easy for users to view more watch faces at a glance (top row), and allow more apps and information to be presented clearly on the device’s circular display (bottom row). Other adjustments include the new app shortcut widget, which displays your most recently accessed apps, and the streamlined Quick Panel, which may now be accessed from any screen, rather than solely via the watch face. The optimizations we’ve made are the results of incorporating user feedback, and make it easy for users to access key functions and find the information they need at a glance. We’re constantly looking for new, innovative ways to optimize UX – not only for the Gear Sport, but for each of our wearable devices. Q. The Gear Sport’s highly customizable design adds another fun layer of versatility. Is this something that was prioritized from an early stage? Jeong: Absolutely. Our aim with the Gear Sport was to present a sports watch with a truly versatile design. The watch comes in two colors, black and blue, and features 13 preinstalled watch faces. The colors of those watch faces may be customized to create a wide array of unique designs, which may also be paired with 23 available straps, yielding a total of more than 3,600 distinct variations. Q. Were there any other fun features that you were able to incorporate into the Gear Sport’s design? 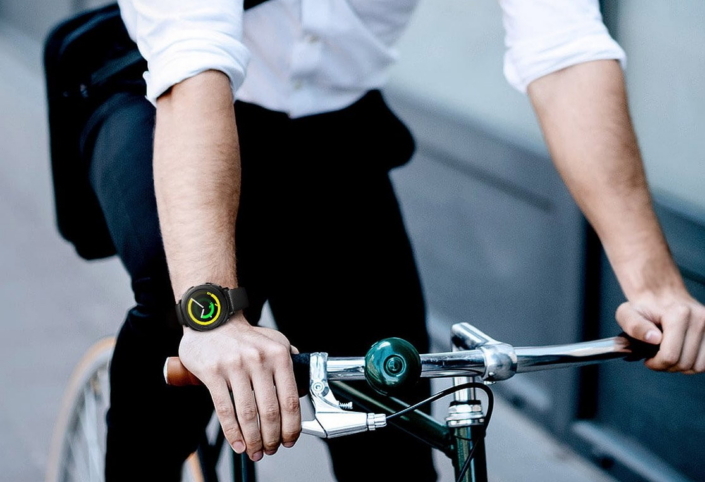 Kim: Because smartwatch users tend to be tech savvy, and IoT-interactions are becoming more ubiquitous in our lives, when designing the Gear Sport, we prioritized optimizing the device for inter-device connectivity. This ultimately led us to develop cool functions that allow users to use the Gear Sport to streamline how they do things like manage PowerPoint presentations, navigate VR interfaces,* and pay for goods on the go.